Welcome to day Five! We have some amazing books to share with you today! 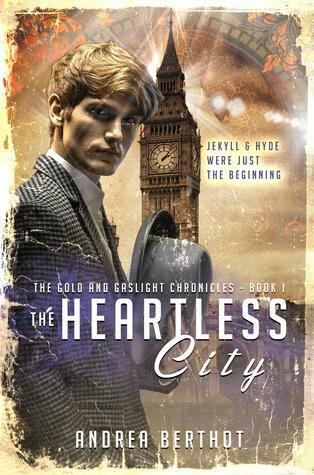 Last up today is book one in the Gold and Gaslight Chronicles! Now take a look a that cover!!! Henry Jekyll was a brilliant doctor, a passionate idealist who aimed to free mankind of selfishness and vice. He’s also the man who carelessly created a race of monsters. Once shared secretly among the good doctor's inner circle, the Hyde drug was smuggled into mass-production - but in pill form, it corrupted its users at the genetic level, leaving them liable to transform without warning. A quarter of the population are now clandestine killers – ticking bombs that could detonate at any given moment. Son of the city's most prominent physician and cure-seeker, seventeen-year-old Elliot Morrissey has had his own devastating brush with science, downing a potion meant to remove his human weaknesses and strengthen him against the Hydes - and finding instead he's become an empath, leveled by the emotions of a dying city. First off I have to say that this cover sells this book!! I don't care what its about this cover does it for me!!! Ok so for the book it was awesome! I love retellings and well I have a soft for ones centered around Jekyll and Hyde! this one was no different! This is one story that grows on you as you turn the pages. Hyde's in this book are monsters that rip out your heart and well they have pretty much killed the population. I have to say that I loved how the author did this rendition of the story and I just couldn't put down! It had a very zombie feel and I loved it! The characters in this one were very well written Elliot and Iris were amazing and the romance world so well! It didn't over power the book but it didn't fade into the background either. The only thing I really didn't care for much was the many MANY descriptions but don't worry they show up less as the book goes on. So if you looking for a creepy story with romance then pick this one now!